Der Rock Hilde und Günter Level 2. 2 Kapitel 1, Seite 1 Was hört Günter? What do you know about Rammstein? 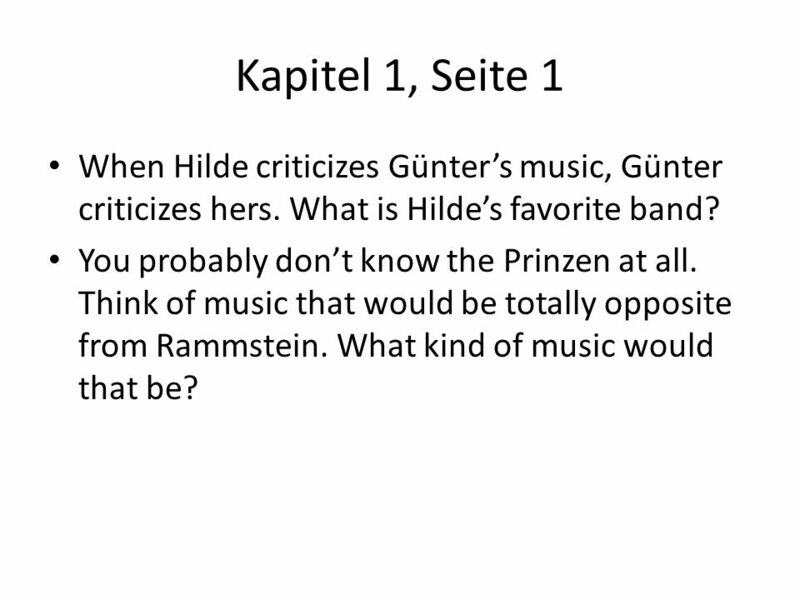 4 Kapitel 1, Seite 1 When Hilde criticizes Günter’s music, Günter criticizes hers. What is Hilde’s favorite band? You probably don’t know the Prinzen at all. 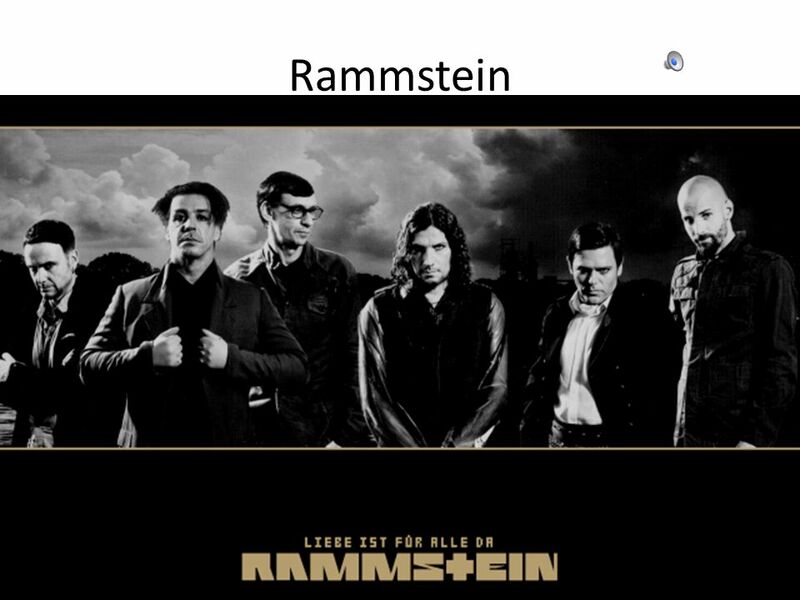 Think of music that would be totally opposite from Rammstein. What kind of music would that be? 6 Kapitel 1, Seite 1 So what’s the case? Is that really a case? Okay, is this just sexist? How does Günter feel about it? 7 Kapitel 1, Seite 1-2 What is “es klingelt”? 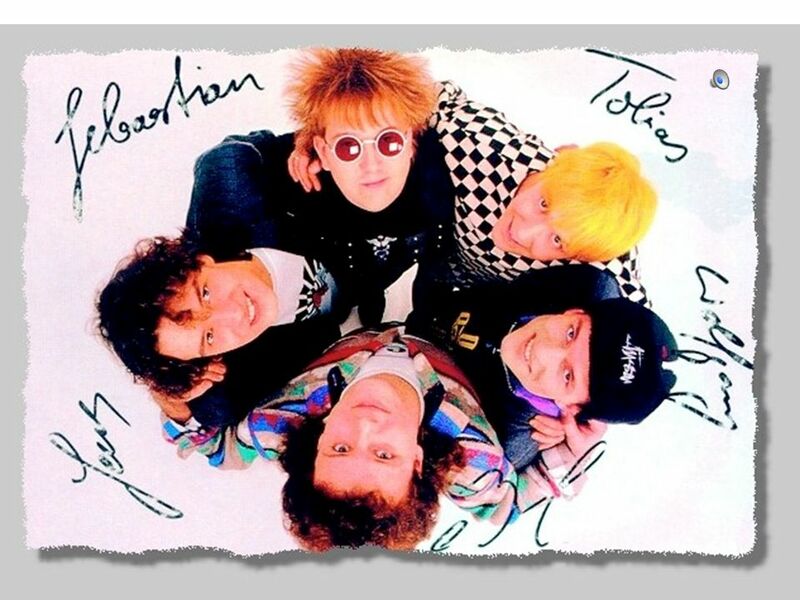 Wie sieht Jutta aus? Ist sie schön? Froh = glücklich What has Jutta tried so far? This is tough: What can you tell me about the look of the skirt? Is Günter really being inappropriate? What is the main idea of Kapitel 1? 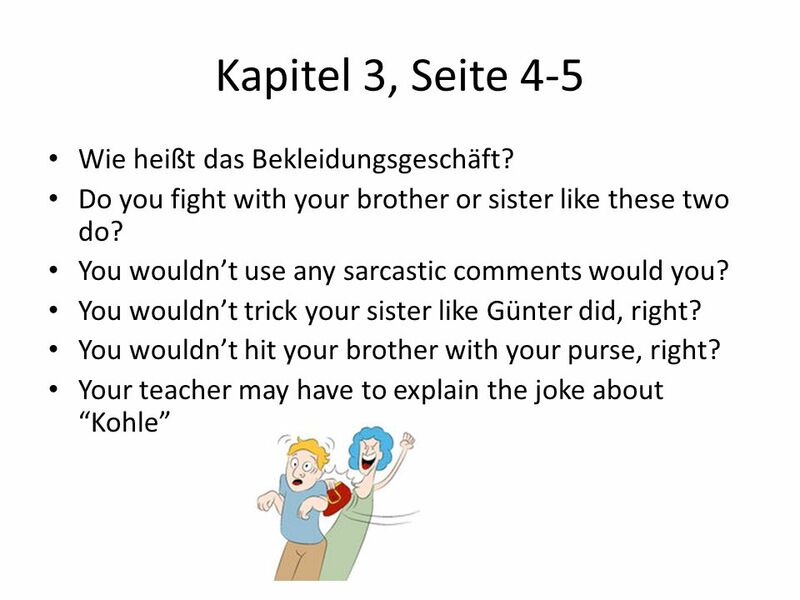 8 Kapitel 2, Seite 2-4 Hilde assumes the worst about her brother. What do you think? 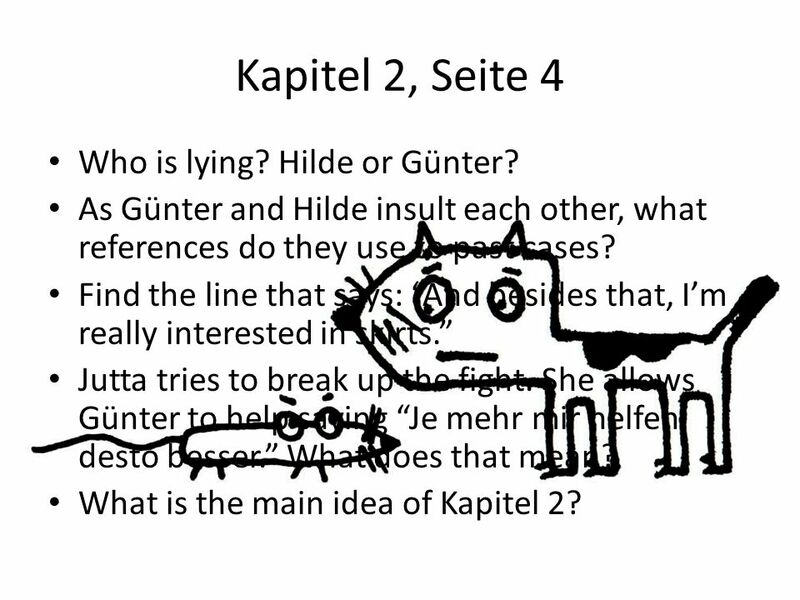 Is Günter as bad as Hilde says? 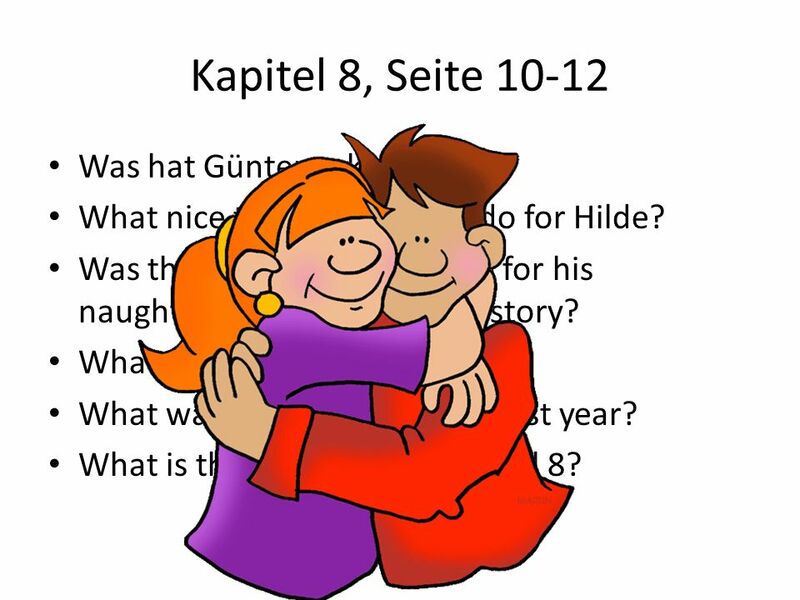 How does Hilde introduce her brother? Why doesn’t Günter give Jutta eye contact? Verzeih mir = Vergib mir = Entschuldige What does Jutta think about Günter? Hilde tries to shoo Günter away saying he doesn’t want to help. But then Günter says “Doch”. What is that? 9 Kapitel 2, Seite 4 Who is lying? Hilde or Günter? 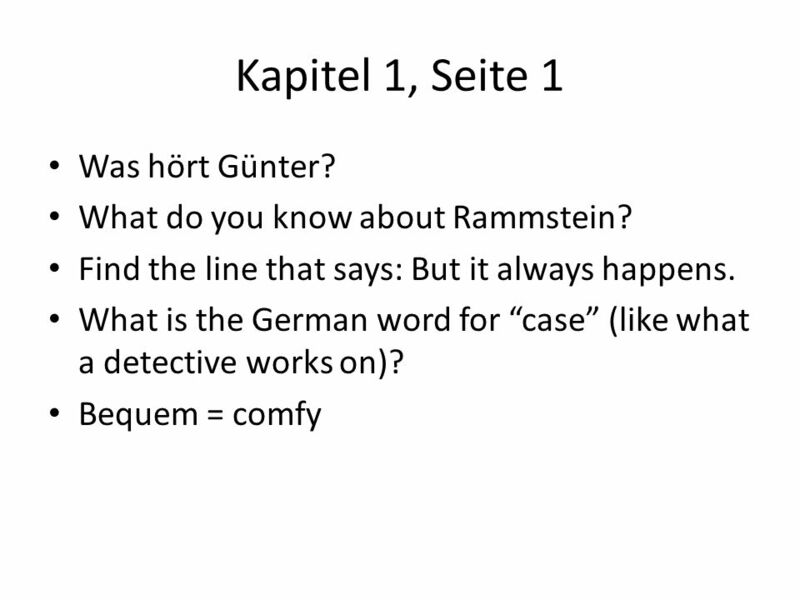 As Günter and Hilde insult each other, what references do they use to past cases? 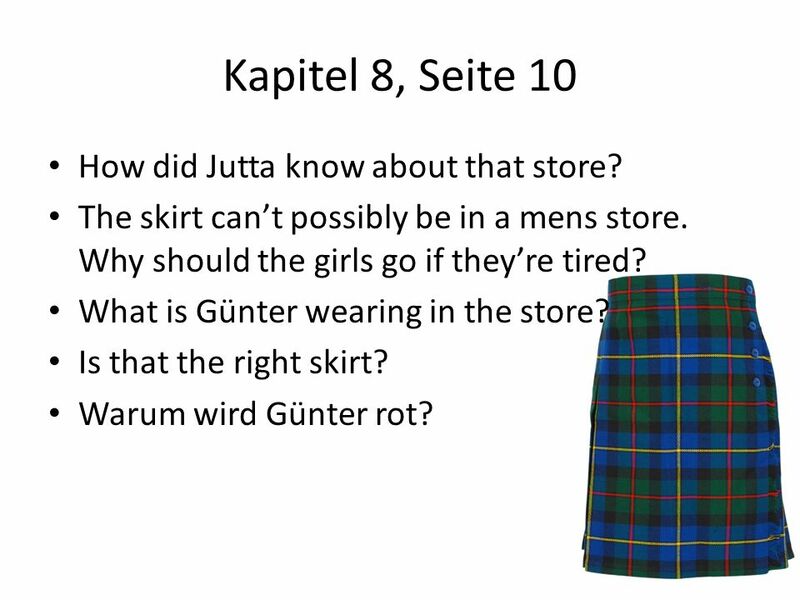 Find the line that says: “And besides that, I’m really interested in skirts.” Jutta tries to break up the fight. 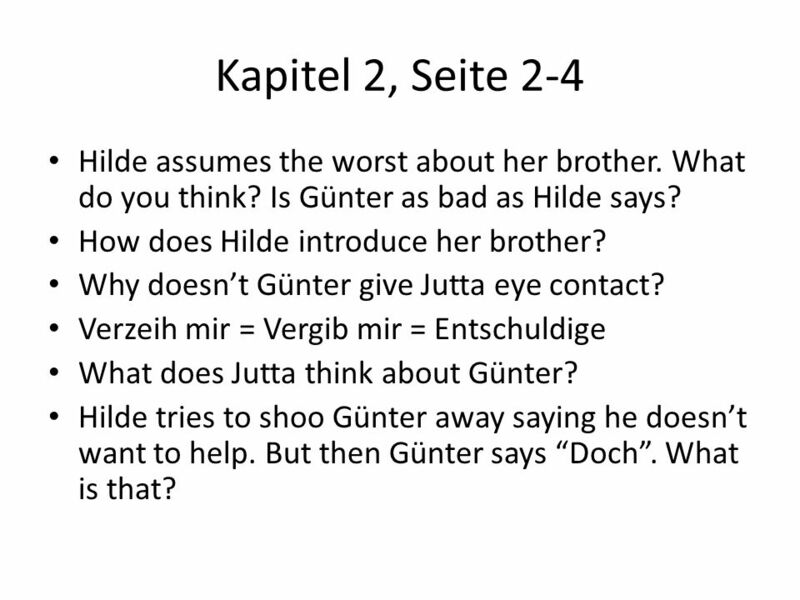 She allows Günter to help saying “Je mehr mir helfen, desto besser.” What does that mean? What is the main idea of Kapitel 2? 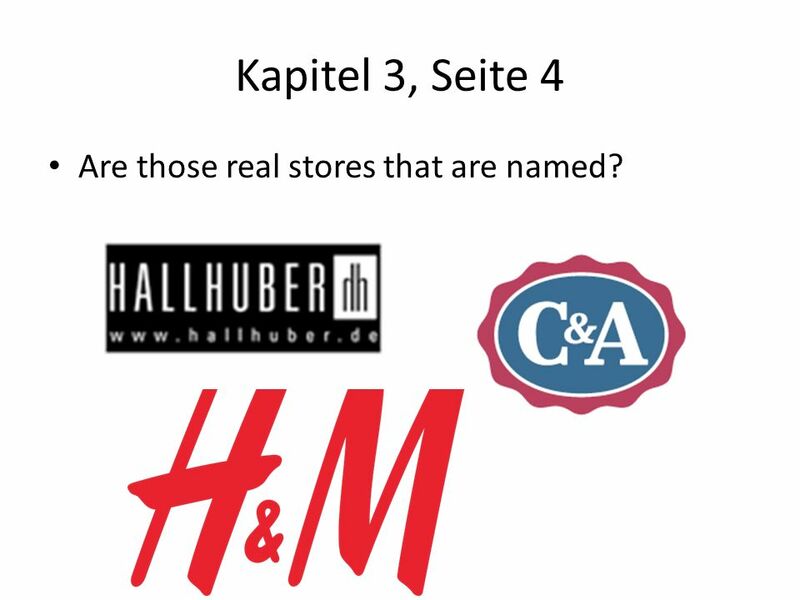 10 Kapitel 3, Seite 4 Are those real stores that are named? 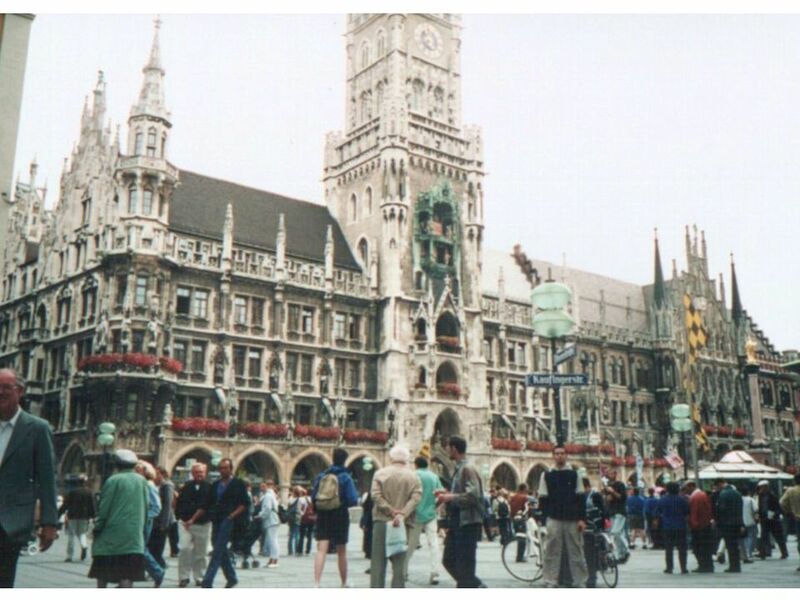 11 Kapitel 3, Seite 4-5 How do they get downtown to the shopping area? 12 Kapitel 3, Seite 4-5 Wie heißt das Bekleidungsgeschäft? 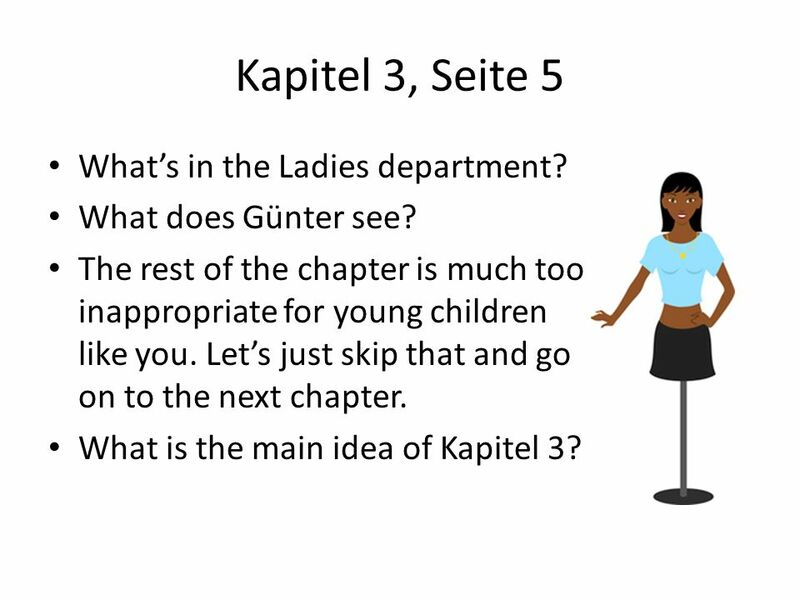 13 Kapitel 3, Seite 5 What’s in the Ladies department? What does Günter see? The rest of the chapter is much too inappropriate for young children like you. Let’s just skip that and go on to the next chapter. What is the main idea of Kapitel 3? 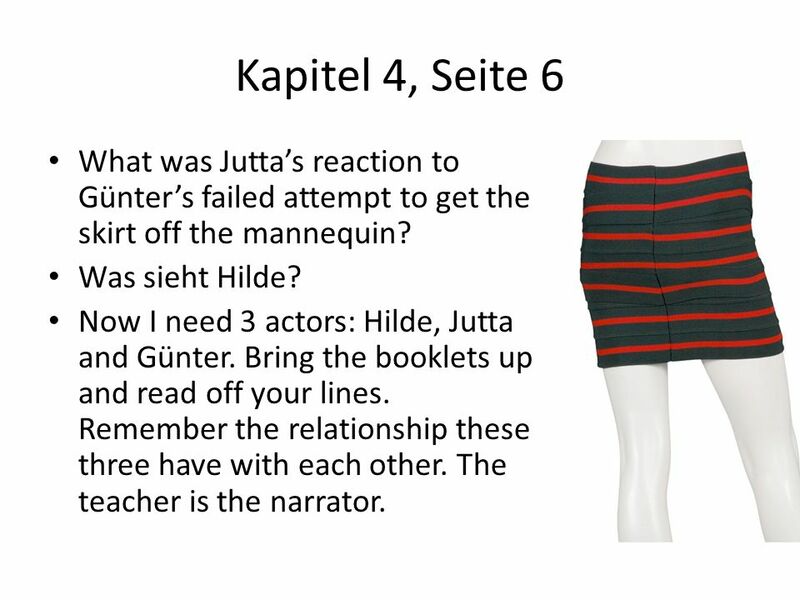 14 Kapitel 4, Seite 6 What was Jutta’s reaction to Günter’s failed attempt to get the skirt off the mannequin? Was sieht Hilde? Now I need 3 actors: Hilde, Jutta and Günter. Bring the booklets up and read off your lines. Remember the relationship these three have with each other. The teacher is the narrator. 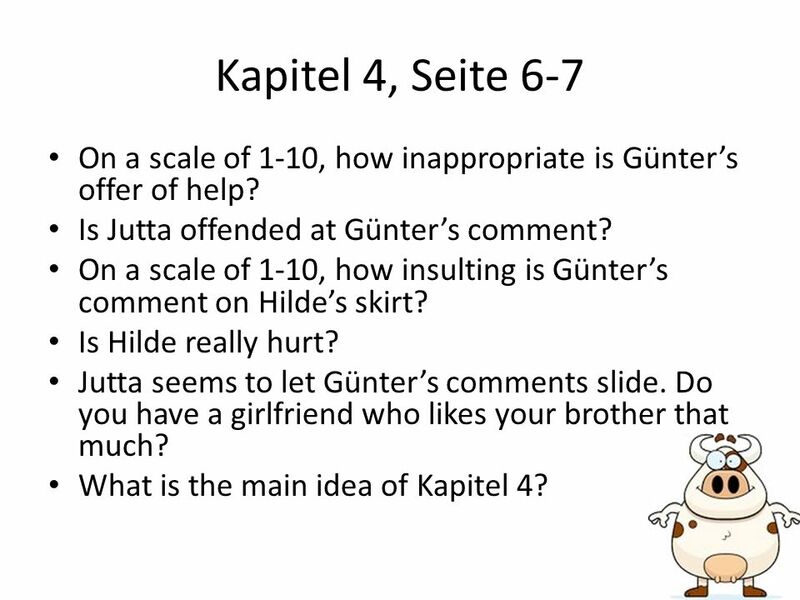 15 Kapitel 4, Seite 6-7 On a scale of 1-10, how inappropriate is Günter’s offer of help? 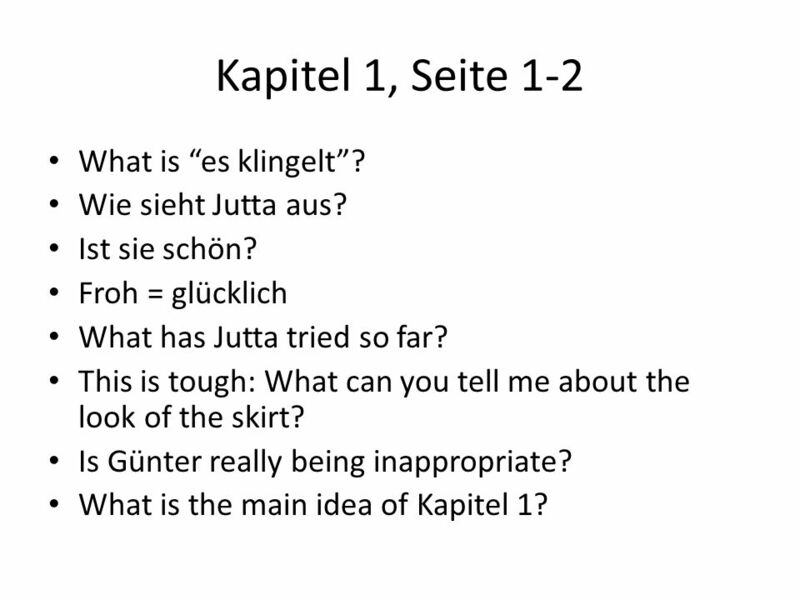 Is Jutta offended at Günter’s comment? On a scale of 1-10, how insulting is Günter’s comment on Hilde’s skirt? Is Hilde really hurt? 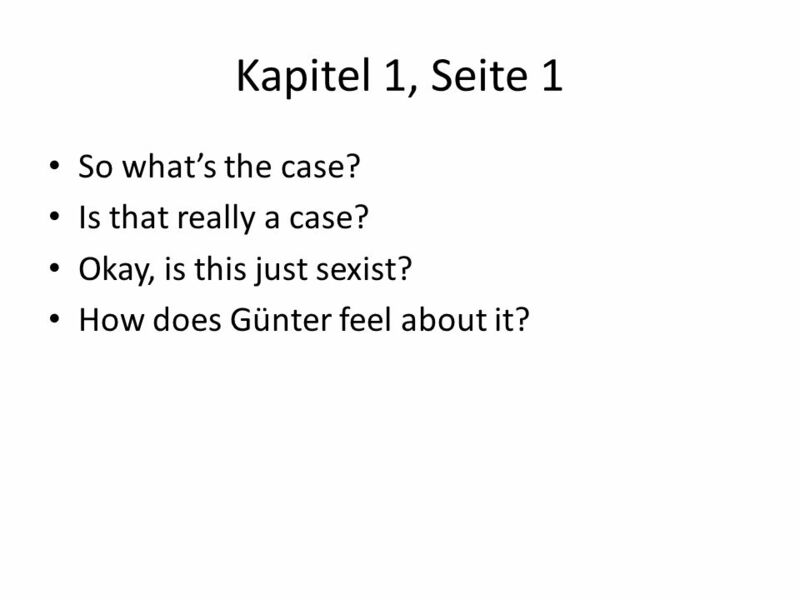 Jutta seems to let Günter’s comments slide. Do you have a girlfriend who likes your brother that much? What is the main idea of Kapitel 4? 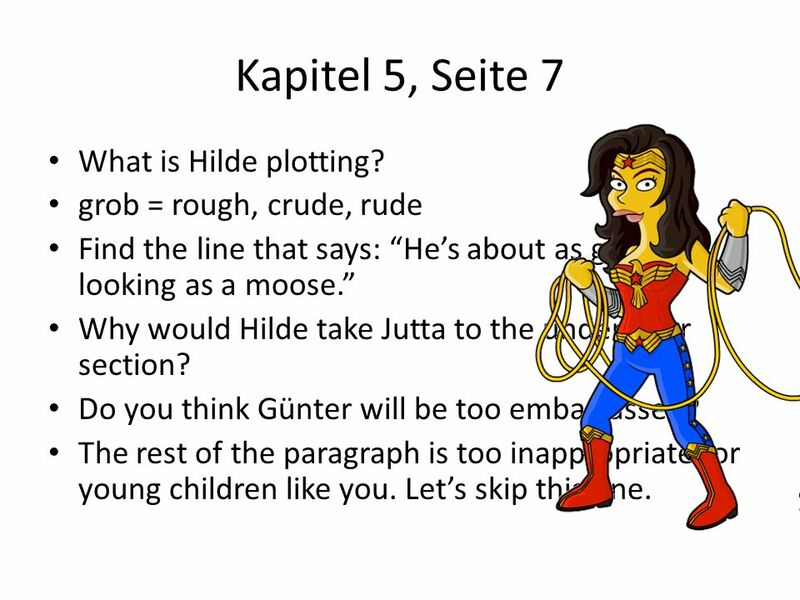 Find the line that says: “He’s about as good looking as a moose.” Why would Hilde take Jutta to the underwear section? Do you think Günter will be too embarrassed? The rest of the paragraph is too inappropriate for young children like you. Let’s skip this one. 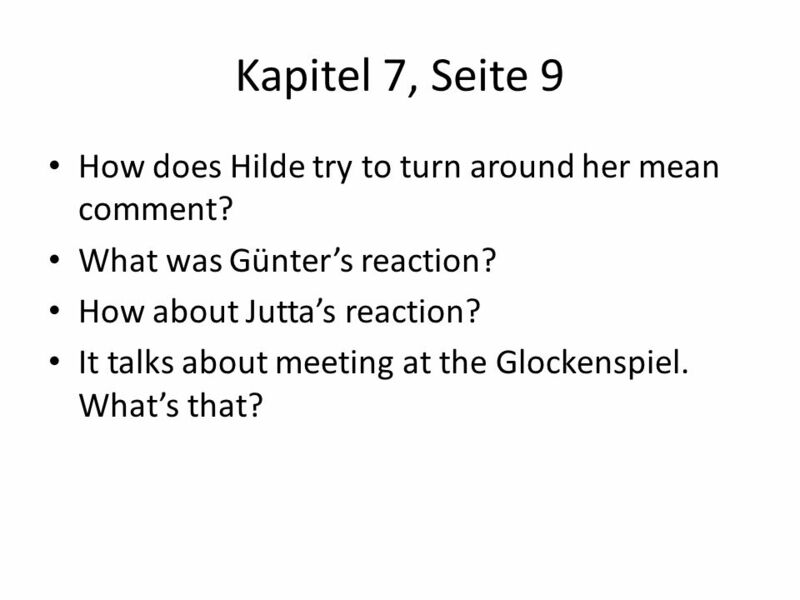 17 Kapitel 6, Seite 8 How does Hilde try to ditch Günter this time? When Günter goes off, Hilde says: Endlich. Er ärgert mich so. What does that mean? Find the German word for “Show-off” or “Jokester”. 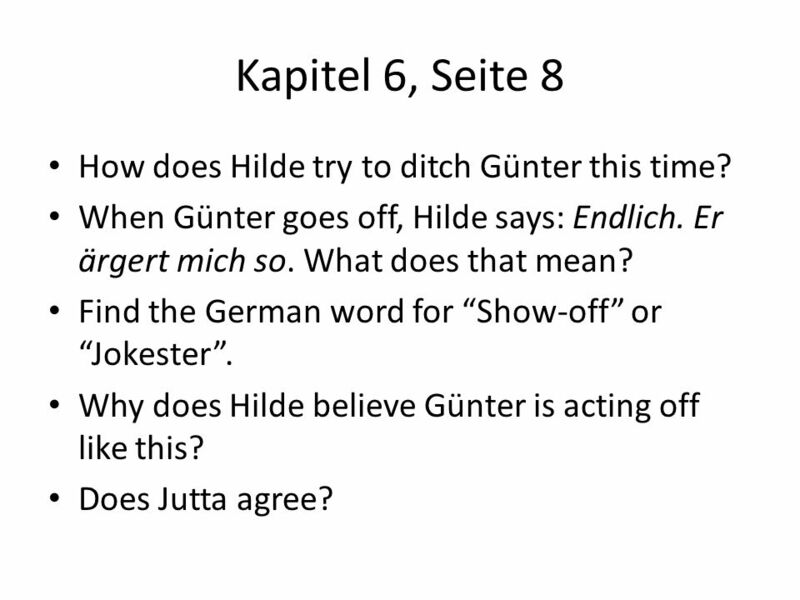 Why does Hilde believe Günter is acting off like this? Does Jutta agree? 18 Kapitel 6, Seite 8-9 Name the jewelry items the girls try on. Was hat Günter an? 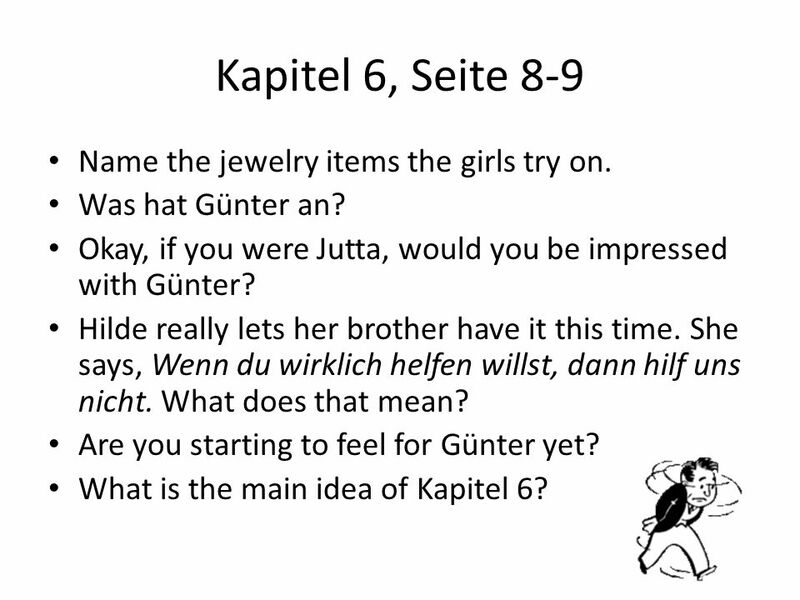 Okay, if you were Jutta, would you be impressed with Günter? Hilde really lets her brother have it this time. She says, Wenn du wirklich helfen willst, dann hilf uns nicht. What does that mean? Are you starting to feel for Günter yet? What is the main idea of Kapitel 6? 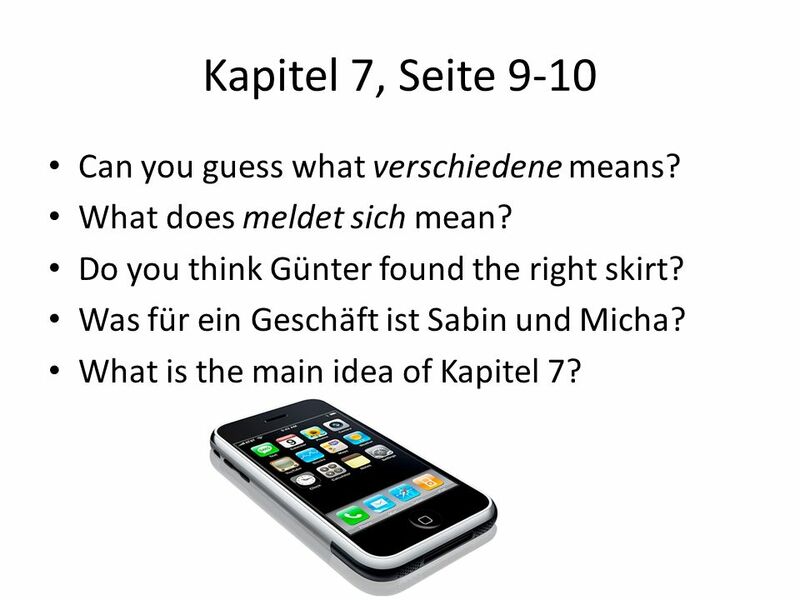 19 Kapitel 7, Seite 9 How does Hilde try to turn around her mean comment? What was Günter’s reaction? How about Jutta’s reaction? 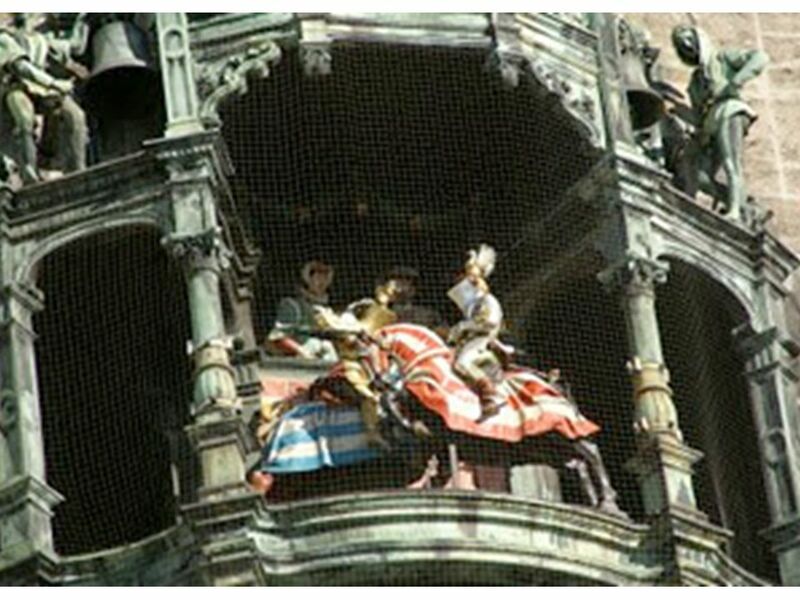 It talks about meeting at the Glockenspiel. What’s that? 22 Kapitel 7, Seite 9-10 Can you guess what verschiedene means? What does meldet sich mean? Do you think Günter found the right skirt? Was für ein Geschäft ist Sabin und Micha? What is the main idea of Kapitel 7? 23 Kapitel 8, Seite 10 How did Jutta know about that store? The skirt can’t possibly be in a mens store. Why should the girls go if they’re tired? What is Günter wearing in the store? Is that the right skirt? Warum wird Günter rot? 24 Kapitel 8, Seite 10-12 Was hat Günter gekauft? What nice thing did Günter do for Hilde? Was that enough to make up for his naughtiness throughout the story? What is Hilde’s reaction? What was the case with Max last year? What is the main idea of Kapitel 8? 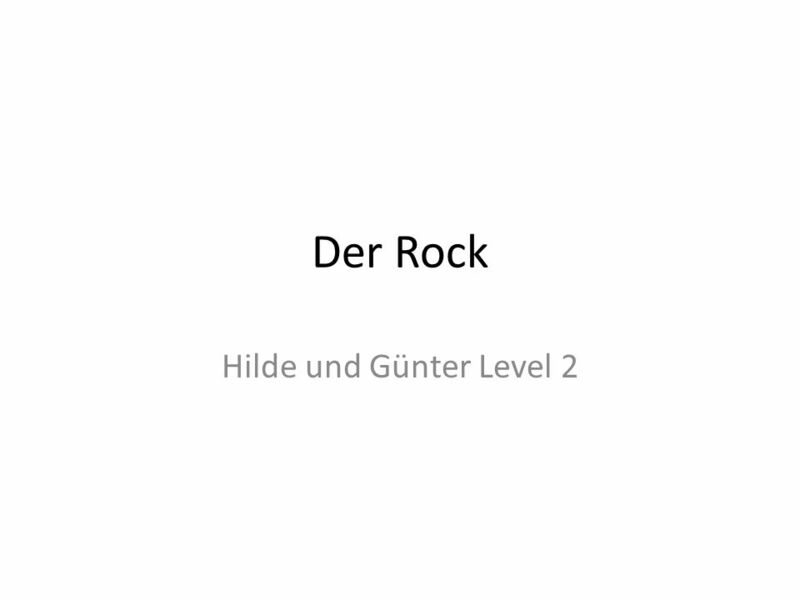 Download ppt "Der Rock Hilde und Günter Level 2." Hilde und Günter Das Vorzeichen. © British Council 2014 Who are these people? What are they doing? Why? Suggestions for Teaching Elaboration Session 2  Asking Questions  Recognizing Elaboration  Show, Don’t Tell Adapted by Kristine Gooding from : OSPI. WRITING CRITIQUE GROUP GUIDELINES Writing responses to your group members’ work and receiving responses from others is the most important step in revising. PowerPoint by: Makayla Martin Period. 8 1/17/14. Plot Summary Save Me a Spot In Heaven was written by Bailey Wind about the severe car crash she survived. The Latest Crop of WALMARTIANS … PLEASE PREPARE YOUR EYES it’s hard to believe … they have gotten worse! Der Fall der schummelnden Schüler. Chapter 1, page 21 Scan through pages Do you think the case is about: – Cheating students – Missing homework. Superflex Superflex…A Social Thinking Curriculum Written by Michelle Garcia Winner and Stephanie Madrigal.